Joyce leaned her black Triumph bicycle against a wall, and shivered in the foggy, early dawn light. Glancing up at the enormous wooden, carved gate, she hesitated. This was a secret world she was about to enter... For 16 year old Joyce, who lived in one of the poorest streets in Cambridge, the college building where she was about to enter represented privilege, wealth, a life she'd never live. As a bedder, Joyce would be working up and down one of the stone staircases, making the beds of the male students, sweeping floors, dusting desks. She never expected to also find herself mothering, chastising and sometimes even covering up for 'her boys'. 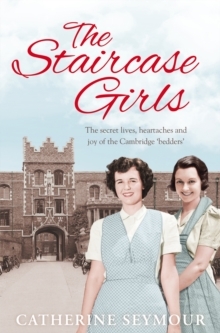 The Staircase Girls takes us into the lives of Joyce and other bedders, like Nance, Maud, Rose and Audrey. They endured the Second World War and then had to contend with poverty, ill health and bereavement. They loved, lost and loved again. But their friendships gave them strength, and their work gave them happiness - and even a lasting connection with their charges, some of whom would go on to run the country. Revealing their untold stories for the first time, this is a vivid, poignant account of these remarkable women's lives.